Isaac Fuller (1606/1620?-1672) studied in France, and became a portraitist and history painter. According to the first historian of British art, Baynbrigg Buckeridge, Fuller had 'a great genius for drawing'. 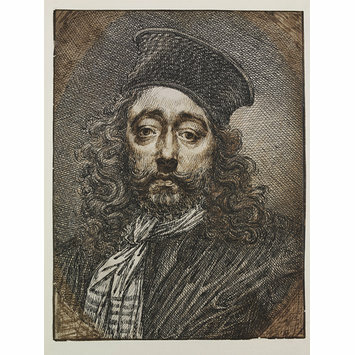 This particular work relates to two similar self-portrait oil paintings, one in the National Portrait Gallery (London) and the other in the Bodleian Library in Oxford. It was probably made either as a preparatory drawing for a print, or perhaps as a work of art in its own right. 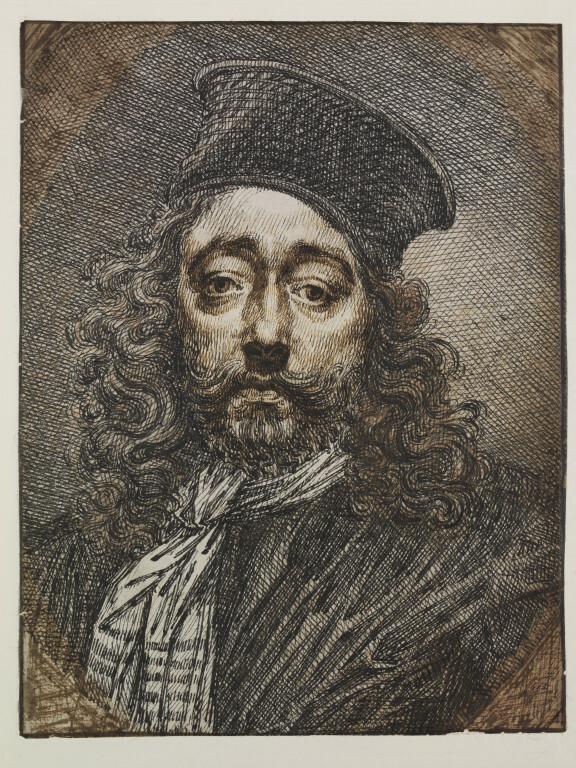 Portrait of Isaac Fuller; Full face, with long hair flowing over his shoulders, a short beard and an upturned moustache; Sketch, in pen, partially in bistre and ink; The indications for extending the oval to a square form are seen at the corners. This is a sketch for a potrait of Fuller. It was engraved by T. Chambers for the 4th edition of Walpole's Anecdotes of Painting, 1763, Vol. III., p. 4, only reversed.